No Docker? Then please read the manual installation on Linux first. SwiftyBeaver Enterprise is running on your infrastructure and is collecting, decrypting, authenticating, organizing and finally storing your end-to-end encrypted client devices’ logs securely on your Elasticsearch cluster. 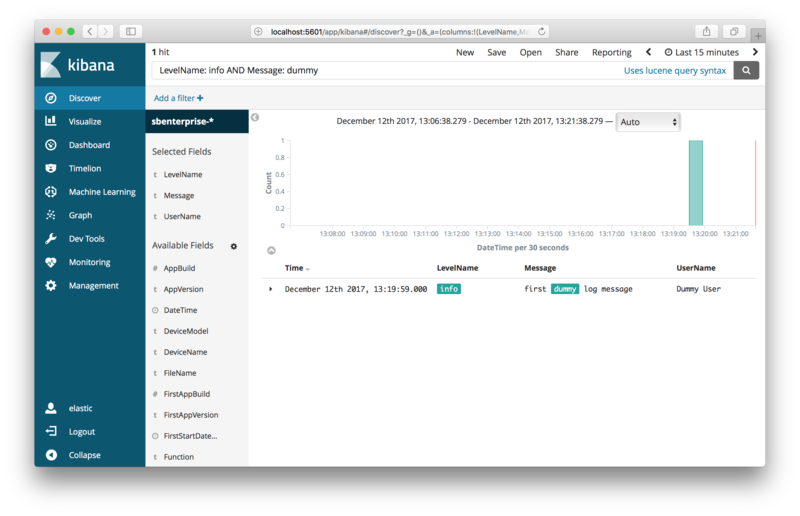 The logs can be browsed and queried using the Kibana Web UI which is also running on your own infrastructure. 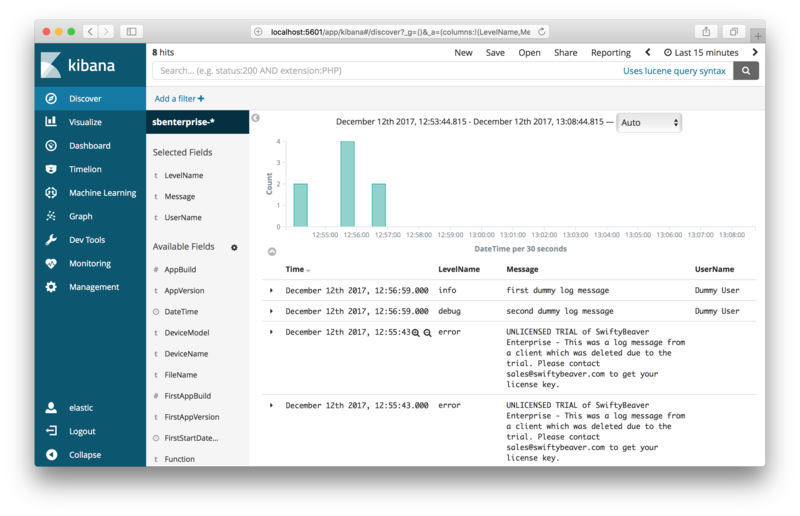 The combination of the SwiftyBeaver Logging Framework, SwiftyBeaver Enterprise, Elasticsearch & Kibana is a uniquely secure, compliant and scalable logging solution for native apps. SwiftyBeaver Enterprise flow of end-to-end encrypted logs from your remote apps into Elasticsearch. Click to zoom. 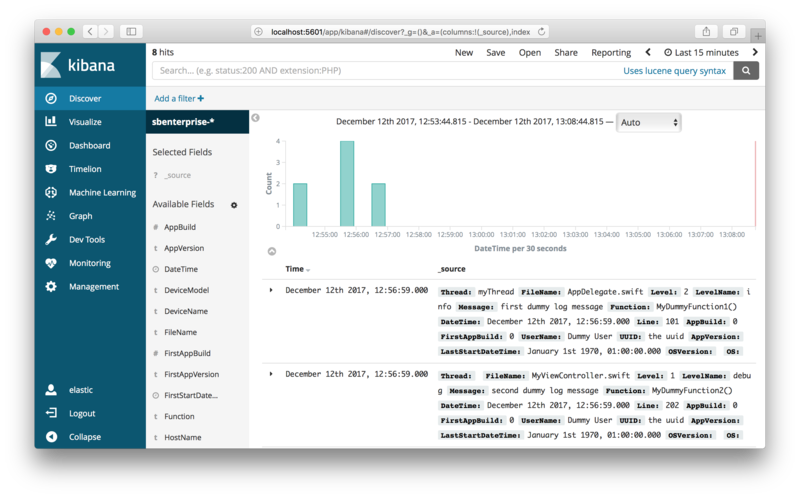 For quick trial or development purpose it is sometimes helpful to have a local Elasticsearch, Kibana & SwiftyBeaver Enterprise setup on a Mac or Linux computer. The only requirement is Docker itself which can be installed via the Docker macOS App. 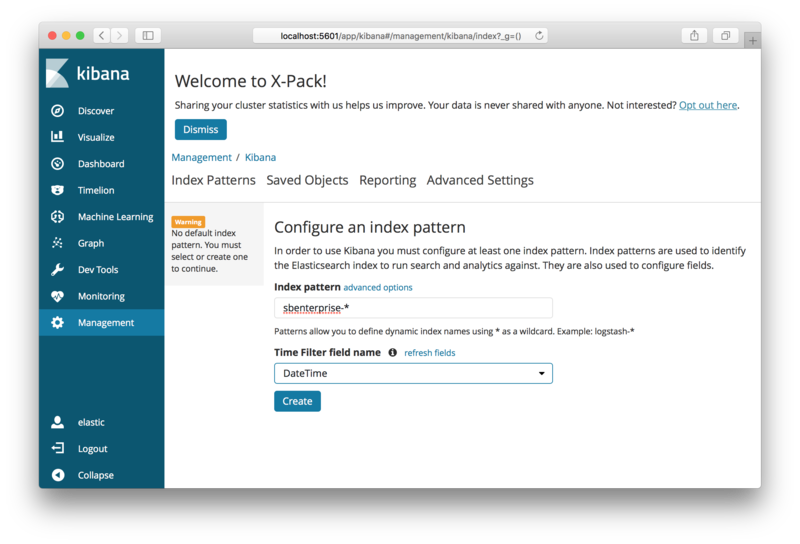 Follow the instructions how to setup Elasticsearch & Kibana locally via Docker and proceed with step 2. You can also use the Docker Compose instructions instead which install Elasticsearch, Kibana & SwiftyBeaver Enterprise faster and easier via Docker Compose. If you follow the Docker Compose instructions then you can skip the next steps 2, 3 and 4 and directly continue with step "5. Create Dummy Log Entries" using your already running cluster. docker build -t sbenterprise . A SwiftyBeaver Enterprise container in non-daemonized mode is created. That makes it easier to read the start messages of SwiftyBeaver Enterprise to spot any issues. The container is deleted on stop via the parameter --rm. Press CTRL+C to stop the container. > Every 2nd incoming log message is replaced with an upgrade text during your trial! > Please contact sales@swiftybeaver.com to get your license key. Now let’s log into Kibana and see if we find the created logs which SwiftyBeaver Enterprise stored in Elasticsearch. 1. Open in your browser the Kibana URL http://localhost:5601 and log in with username "elastic" and password "secret". 4. Now click in the "Available Fields" list in the gray center area on the items "LevelName", "Message" and "UserName". The list of logs will be now reduced to just show these fields as columns. 5. Let's query our logs and search all logs which have the "info" LevelName and the log message contains the word "dummy". In Kibana that can be done by entering the following search query into the search field: " LevelName: info AND Message: dummy"
You have now a working and connected local Elasticsearch, Kibana & SwiftyBeaver Enterprise stack as proof of concept. As next step you can setup a production system in the cloud or on your own infrastructure, including load balancer, high availability and high scalability and let your native apps securely send logs to it. You can browse these logs in Kibana in the same way as you did in a secure and scalable way. And finally unlock your SwiftyBeaver Enterprise installation by ordering a license key.